Metacal 3000 | Caltra Nederland B.V.
METACAL® is a highly reactive aluminium silicate and like silica fume and fly ash is a pozzolan. It is produced by calcining the best quality pure kaolin at a temperature between 750 and 800ºC. METACAL® reacts with the free calcium hydroxide (lime) produced during the cement hydration to produce additional calcium silicate hydrates. Addition only slightly alters the water amount needed for the total mix design and improves the workability. 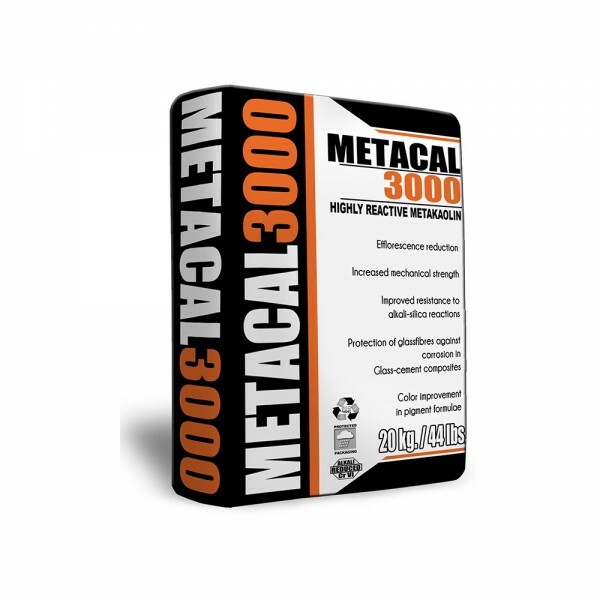 METACAL® is a ultra fine white powder used in concrete and dry-mixes to replace part of the cement or as a straight additive. increases considerably the adhesive strength as well as the compressive and flexural strength especially at early stages. greatly reduces or eliminates ASR (alkali silica reaction).Since it reacts with lime it lowers the alkalinity and therefore decreases the reactivity of the silica. reduces the risk of efflorescence. It reacts with the lime to form extra calcium silicates and therefore lowers the permeability. reduces shrinkage. Because it replaces a certain amount of cement in the matrix and does not change the amount of water needed it will reduce the shrinkage. is used in conjunction with (AR) glass fibres because it reduces the alkalinity in the cement matrix which attacks glass. is a colour hardener since in concrete, tile grouts and coloured renders it binds the free lime and increases the impermeability.